WINNIPEG, MB – The latest limited edition release from Half Pints Brewing has been announced, with release set for next week. The Old Red Barn is our first foray into the wild world of sour beers. This special ale is fermented with a mixed yeast culture that takes almost two years to produce all the complex flavours that you’re about to enjoy. Fermented in stainless then barrel aged for two summers, the beer reminds one of the sweet rewards of patience with cherry pie, vanilla, and almond aromas. The flavour is bracingly tart with a background of oaky vanilla and a low hop bitterness to accentuate the bready malts. 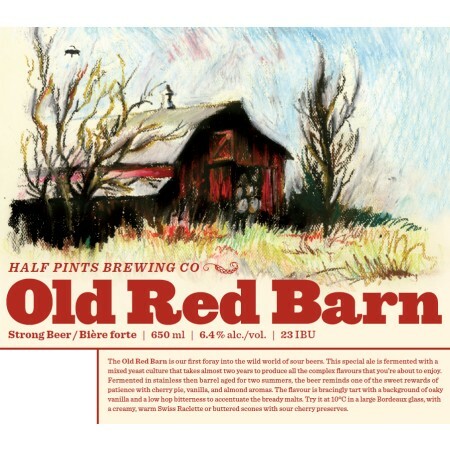 Old Red Barn will be released exclusively at the Half Pints brewery retail store at 9:00 AM on Saturday May 25th. It will retail for $13.30 (plus tax and deposit) per 650 ml bottle, and sales will be limited to 3 bottles per customer while supplies last.